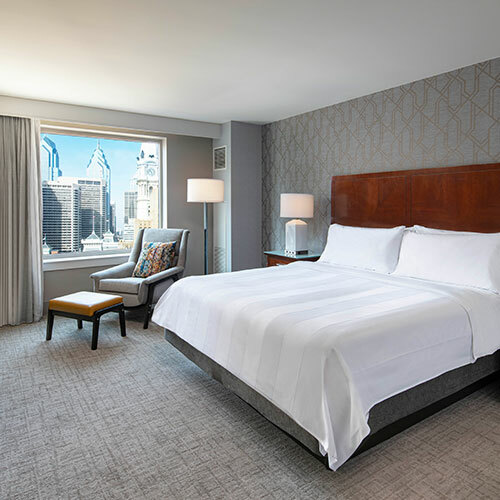 Located within steps of city hall, the hotel has a spacious lobby and well-coordinated guest rooms where you can enjoy 24-hour room service on your comfy pillow-top bed. Guests attending an event at the convention center will appreciate the direct entrance. Smoke free premises. 1408 units. 23 stories, interior corridors. Accessibility (Call). Between 12th and 13th sts. Adjacent to convention center. 1201 Market St 19107. Station: 13th. refrigerators, coffeemakers, pay movies, safes. Fee: high-speed Internet, wireless Internet.